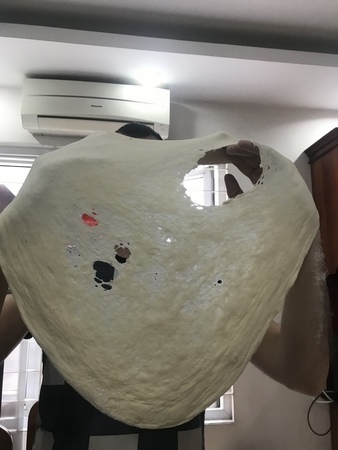 So... I’m gonna open a pizza shop and my dough is tearing while stretching. I’m gonna do slices so it’s 18’’ pies. At first while I was hand kneeding the doughs they were coming out ok and quite stretchy, but since I’ve started using the dough mixer with a twisty hook the dough stretches ok at first, then starts tearing badly. My technique was good enough to stretch the hand kneeded dough so i don’t think the technique is the problem. I’ve read up about it and I’m wondering if there’s a problem with the gluten forming or something. When I see the YouTube clips their dough is stretching so nicely, but mine is not. So sad. 0.35% IDY in warm water for 10-15 minutes with 0.18% sugar. Then that goes in the mixer with the flour with the salt 1.75%. The hydration is 60%. Then we mix it slowly for 10 mins and fast for 10 mins in a twisty hook style dough mixer. We ball it up and oil the balls and leave it cross stacked for 30 mins before sealing. We took it out the last time after 36 hours. It rose well and looked good and felt good. All up until we did the stretching and it tore. There’s a pic attached of the tearing. I hope you guys can help us. We’re gonna open a New York slice place soon in Asia and we want it to be amazing. Thanks pizza people, we really appreciate your help. What flour are you using? Is the fermentation done at room temperature or refrigerated? It looks as ifyou were stretching it in the middle way too much. Work the edges and not the middle. Id also suggest a full 2day ferment.